Positively EZ or easily positive? My biopsy was collected on the afternoon of September 24, 2015, by Dr. Duffey in the urology clinic at the Brooke Army Medical Center (BAMC) within the San Antonio Military Medical Center (SAMMC). As I dressed afterward, Dr. Duffey said, "Make an appointment to come back in two weeks. I don't share results over the telephone -- good or bad, I do it face to face." My appointment for receiving the results was made for the afternoon of October 8th. It was a convenient time, as I already had an appointment scheduled at the ophthalmology clinic on the morning of that same day. For at least 10 days prior to my appointment I found that I was unable to accomplish anything and could not concentrate for 10 minutes. I couldn't read, I couldn't write, I couldn't watch TV or a movie. I did not know why until I realized that at some level I was frightened. Upon that realization, I went and talked to a friend, really opening up. That helped. I checked into the urology clinic after lunch on the 8th and was directed to the waiting area to see Dr. Duffey. As I sat on the slippery vinyl I tried to anticipate my appointment and receiving the feedback that the biopsy was negative. I mean, after all, I'm not sick, I have no pain, must be no problem, right? What, exactly, would I tell my family? Would I write about it in my blog? Would the doctor ask me to repeat the biopsy at some future date? With these thoughts in my head, I drifted into a light sleep. "MR. MOYES!" Oh. My name. My appointment. Shaking my head to awaken, I stood and received my direction to Dr. Duffey's office, where I was greeted and seated. Dr. Duffey did not mince words: "Your biopsy was positive." There was more; a lot more, and I think I actually recall most of it, but I don't need to write about it here. The summary: of fourteen needle biopsy samples two were negative for cancer, four were questionable, and eight were positive. Of the eight positive samples, some had as much as 60% of the cells cancerous. This cancer, prostate cancer, is rated for risk using something called the Gleason Scale rated from 2 - 10. I recall that Dr. Duffey was professional, positive, and kind. He had earlier, before the biopsy, explained carefully that prostate cancer is not a death sentence -- it is generally not aggressive and most men of my advanced years that are diagnosed with prostate cancer die with the disease, not of the disease. And it is common: nearly half of the men who reach their mid-60s will have prostate cancer. With a Gleason score of 7, I am a patient of "Intermediate Risk." Dr. Duffey outlined my options: (1) Watchful waiting; (2) Prostatectomy by surgery; (3) External radiation therapy; (4) Implanted radiation "seeds." I, the patient, must decide which course to follow. Option 1, watchful waiting is not a good choice for a Gleason 7, Dr. Duffey says. Option 2, surgery is Dr. Duffey's choice, but he is a surgeon and admits to prejudice here. Option 3, external radiation is, he says, also a good choice and tells me I'll consult with a radiation oncologist before I make my decision. Option 4 is not done at BAMC. So that leaves options 2, surgery, or 3, external radiation. Dr. Duffey assures me that I don't need to make the decision right away but again stresses that I will have to make the decision. He explained that I (and my wife) would be enrolled in their comprehensive prostate cancer clinic whereby we would receive broad counseling from every medical and helping specialty known to man. I was introduced to Janet, who runs the comprehensive cancer clinic and she enrolled me (us) and gave me a verbal overview. In addition to the counseling, we will meet with survivors and current patients and have group sessions. Our first appointment for the comprehensive clinic is scheduled for the 28th of this month. Only after meeting with and being briefed by surgeons, radiation oncologists, nutritionists, psychologists, financial counselors, and the kitchen sink will I have to decide on a course of treatment. I left the clinic on the eighth of October with a bagful of reading assignments: books, leaflets, pamphlets, sheets, and a long list of internet links. So, I have cancer. Cancer that is common and is not normally considered to be aggressive, not normally considered to be fatal. But my particular cancer is on the more aggressive side of the scale for prostate cancer, hence the Gleason score of 7. I have cancer. It does not have me. I will have to make a treatment choice. Right now I'm leaning toward the surgery, but I won't make a final decision until after I speak to the range of counselors. Modern surgery is much less invasive than in recent past years. They use an orthoscopic technique with robotic assistance. The doctor says convalescence is normally comparatively short and most men are back to full function within about three months. Some men experience a loss of sexual function with the prostatectomy. Some don't. There will be other side effects with surgery and with radiation therapy. We will deal with those as needed. This is so new to me, because, you see, at age 65, I've never had any invasive surgery; never been hospitalized, and rarely ill beyond a head cold, so I've been blessed up until now. I did have a small skin cancer removed from my upper back a couple years ago, but that was outpatient, quick, and painless. Now I'm reading the book, "What helped me get through" written by and about cancer survivors. I have shared the news with close friends and family. I don't see any reason for this to be a secret, but I don't think the world needs to know, either. But I need to clarify my thoughts, and writing is one way I do that, so I'm writing. I'm working. I'm scheduling and attending events with my family. I'm enjoying things that I want to enjoy. I've also told my three sons that they are at increased risk of prostate cancer (their uncle, my eldest brother, is a prostate cancer survivor, so the tendency is definitely in the family) and advised them to ensure they talk to their doctors and get their checkups. Over the next weeks (months?) we will be busy with appointments and procedures. We will deal with it and do what needs to be done. I thank our Father in Heaven for the good years I have had and for the good days I am having now. My last two blog posts are about family and friends time. It seems sweeter now than ever before and I am thankful. Friends and I are working on an idea for founding a nonprofit organization that should do a lot of good. I am thankful for the opportunity to contribute in a small way. I think I'll take the initiative to do my home teaching, visiting the few families in our ward congregation that I've been called to minister to. I am thankful for that opportunity. And with this, and for now, I wish you all well. Guys: Talk to your doctor. Have your exam!! Even after nearly six years of drought, there is still some water flowing. I think it was the 17th of October. My apologies to Chicago, and to the 4th of July. A couple weeks ago, my better half said, "We should go away for the weekend. It doesn't have to be far." Now this was a surprise, as she has, for more than 47 years, been adamant that we had to be home and in church on Sundays (and on the rare occasions we have been on travel, we have, at her urging, sought out an LDS congregation to attend church with). Planning relaxing and fun away-type events has been difficult as normal weekends are really short and Sunday falls smack in the middle of most three-day-weekends. I'm less devout and would gladly skip the meetings occasionally, but when Momma's not happy, nobody's happy. Rare species of birds, such as the green kingfisher, can be seen year-round. The endangered black-capped vireo and golden-cheeked warbler nest and feed in the park in spring and early summer. Wild animals include gray fox, white-tailed deer, armadillo, raccoon, bobcat, rock squirrel and javelina. Picnic and play area; river behind photographer. The park also boasts a great tree-covered grassy picnic and play area with shaded picnic tables. Now I don't have a positive history when it comes to planning outdoor events. At MY outdoor events, the weather generally does not cooperate, and has, in the past, ranged from July snowstorms to January thaws and includes at least one family picnic event interrupted by a small Tornado that claimed our picnic and gear, lit charcoal grill and all, which is a rare event in San Antonio. Nevertheless, I invited family members in the San Antonio area to join us for a Saturday picnic and lawn games and just pretended that all would be well. 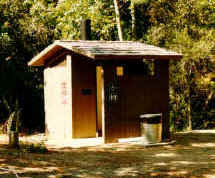 Our original plan was to rent a cabin in the nearby Garner State Park, and do some civilized camping, but when I learned that the cabins cost $160 per night, I decided that "camping" in a reasonably priced hotel in the town of Kerrville would be just as much in the pioneer spirit for folks our age. So two nights in a hotel less than 100 miles from home. That counts as a vacation doesn't it? We met our son, his wife, and our grandson at the Cracker Barrel near our hotel at 9:00 AM on Saturday and after a hearty breakfast, we picked up some prepared chicken and salad then traveled south, with my eldest son at the wheel, on the famously twisty two-lane Texas Highway 16 (http://www.hillcountrycruising.com/highway16.html) to the town of Medina, where we turned West on the slightly more civilized route 337, thence to the park. Most of the trail is shaded. We were in the park just long enough to claim and set up a shaded table when our youngest daughter arrived with a friend. The picnic party was complete! It turns out the weather was fabulous, the food was tasty, we had great fun playing horseshoes, throwing a frisbee, hiking the park's trails, and just lazing in the shade while socializing. A few of us even got in a short nap on blankets spread on the lawn. A little after 4:00 PM we packed up and headed home (or headed hotel, as appropriate). Great family time, beautiful natural setting, and cooperative weather, sunny but not hot, fluffy clouds to excite the imagination. Everyone's travels home were safe and timely. My better half was in good spirits and happy, even knowing we would not be home Sunday morning for church. And, as it turns out, an old friend happened to be traveling through the area and we were able to meet for a great reunion brunch on Sunday morning. A truly blessed Saturday and Sunday. The motel was my kind of camping, clean and safe with running hot water, and for so very much, I give thanks! The color change is slow this year due to warm weather, but it has begun! 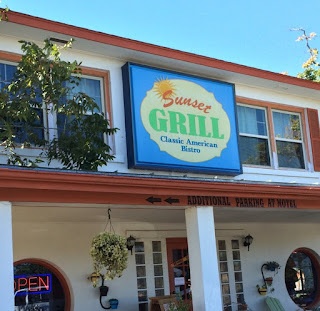 My eternal companion and I enjoyed a great brunch with a dear friend of many years and her husband this Sunday at the Sunset Grill in Fredricksburg, Texas. They are in Texas from their Colorado home for the wedding of a niece and brought along a sister-in-law and brother-in-law (not a couple) to join us. Conversation ranged from ancient war stories to current concerns of aging families and medical concerns to the little-known German, Hungarian, Polish, and Italian history of the Texas Hill Country and much joyous laughter and heartfelt empathy occurred. The food and service were great and the early fall weather was pleasant. Sometimes simple things really are the best. We passed up church attendance for the opportunity to meet and eat with these special friends, and I am NOT sorry! This is not an easy discussion, but it is one we need to have. The mass shootings are horrible, and I believe that we, as a society, have a moral responsibility to take preventative action. Now, what we need is to define a meaningful course of action. Help me out here: considering recent history which includes mass shootings where the law forbids firearms, what do we do? Help me to define a law or an action that would have prevented this most recent shooting, or one of the earlier ones. *How* do we make sure the crazy, sick, angry and lost people don't get a gun (or a knife, or a bat, or a rock -- FBI statistics show that more people are murdered with a knife in the U.S. than with a gun)? Norway has some of the world's most strict firearm laws, yet Anders Behring Breivik was able to bypass them all, obtain weapons, and kill many youngsters. There have been mass shootings in Finland and other non-U.S. lands. In fact, when corrected for population density, The top 5 countries for mass shootings per capita all have “restrictive” gun policies--the U.S. is seventh in that list when corrected for population density. Perhaps it is a culture of violence (movies, games, music) and a lack of respect for human life (capital punishment, easy abortions) that is to blame?